I like to take my children to the church service with me. I get the feeling from looking around that I am a minority. Most of the people around me would prefer I conformed. Our church has a wonderful children’s ministry with vibrant classrooms, talented musicians and teachers, carefully planned lessons and extensive safety precautions. You might say it is just about perfect. So what in the world compels me to bring my children into church? Our family is not in a situation where we can take our children into the service with us right now, and frankly it breaks my heart. 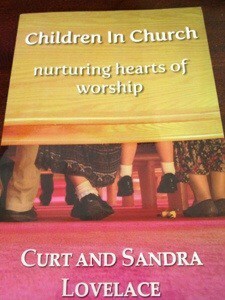 Children in Church: Nurturing Hearts of Worship by Curt and Sandra Lovelace has the most excellent apologetic regarding family togetherness in worship I have ever seen. If you are on the fence, if you have never thought about it before, or if you are just wondering what the big deal is… this book will answer your questions. Not only do the authors carefully outline Scripture concerning the inclusion of children in public worship, they also provide much needed help in the form of practical tips, tricks, and case stories. One thing I appreciated about Children in Church and the approach of authors Curt and Sandra Lovelace is that they did not promote a lack of discipline in the public worship service. Instead they provide an admonishment both to the parents and those without children. Parents should be actively engaged in the training of their children in an attitude of respect for worship and those without children should be actively supporting parents who have made this choice through positive attitudes and perhaps even assistance. We attended a family-centric church for years and took our children into the service faithfully from birth while we attended that church. How I would have benefited from the practical parts of this book during those early years! Even now, I find myself thinking “Oh, I could use that idea.” or “Here is something I had not thought of doing!”. Children in Church gives me the confidence to try again just as soon as it is possible. My Bottom Line: I wish everyone would read this book. I pray for a revival of interest in preserving the family and the role of the family in corporate worship. I pray for the day when my children will be in the worship service with me again. I highly recommend this book. The Giveaway! If you would like your very own copy of Children in Church, leave a comment with your tips for integrating your children into the worship service! Then click enter on the rafflecopter form to open up more entry options. Thank you so much for this wonderful review! We loved Children in Church so much when we read it that we had to publish it! I thought your readers might be interested to know that Curt & Sandra, the authors, serve the Lord in Prague, Czech Republic, helping families internationally disciple their children and encouraging homeschool families overseas, too. We’d like to invite you and your readers to join Children in Church on Facebook at http://facebook.com/childreninchurch and on the web at http://childreninchurch.com. Thanks again for reviewing Children in Church — we love to read your reviews! I take mine into places where they need to be quiet and still from a very young age. My three and four year olds understand there are times to be quiet and pay attention and times to play. I allow them to play freely and openly… in the right time and place. I think that having that balance really helps them focus on things like church when they need to. I don’t think that we should expect them to sit totally still or be totally quiet. Part of the learning experience for them is asking questions, so parents must be willing to answer those questions. I personally am a fan of children’s church because it allows children to learn in developmentally appropriate ways. But I also understand the need for having children be a part of the larger church worship experience. We have our children stay upstairs during the first part of the service during music, offering and prayer time and then head downstairs for a special time of children’s church designed just for them. I have no ideas. I’m interested in the concept, though. Thanks for the chance to win. Practice at home during family worship! I love having my children with me at the beginning of the service throughout the worship/singing portion. I lead the the CM and when we are excused to children’s church we exit together and have an age appropriate lesson for all the kids! I love that many kids sit with their parents for worship-something I know isn’t happening at home. What a wonderful opportunity as a parent to model worship to your child. I think family discussion after the service, and incorporating even the youngest children in the discussion, will encourage them to want to be a part of the service with the whole family, and bring “something” home with them to add to the family time discussions! Make it fun… Allow them to be children (because they are)… Model for them authentic worship, not just how to “behave” in church. They will get it! I love this!! Thank you for the chance to win this book!! I think it is fine to take quiet things (like beeswax to mold) for kids to do while listening to sermons. I think that sometimes it is hard in some churches for children to enjoy the music portion of the service b/c I’ve noticed a trend in turning the volume up too loud. I would love churches to be more sensitive to the hearing of children (as well as those with sensory problems or autism that make louder worship music very hard to enjoy). Thank you for this review! I would love to read this book. The biggest piece of advice I can give is to NOT give up! 🙂 I too believe children should be in service with parents, especially once they reach about the age og 6 or so. But in my opinion, the earlier, the better! I have in the past when the kids were too small to do their own notetaking, written down words that were sure to be said in the sermon, usually picking them from the outline sheet. I then had them make has marks for each time they heard that word. It made them listen and taught them them basics of making a note about what they heard. This looks like a great book. I grew up in church with my mom sitting by her side with my 7 siblings. My sisters and I do this with our children. It is hard though when they hit to walking stage and want to be all over the place. I usually bring quite books for my 1 year old. Right now my 4 year old is attending the children’s church after the singing. I like that the children are all together. He is there now because I know the teacher really well and he is working so beautifully with the children. When he gets a little older though I want to have him with us again. I don’t have any ideas, but I would love to know how to go about doing it in a church where almost all kids (if not all) go to the nursery and children’s ministry. Hi! I am so excited about the book. I too feel notice very few families in services worshipping together. I have even visited some where it is not allowed. I would love to read your book. I apologize but I cannot think of any tip to give that would really be helpful. This book sounds like its right on time for me. My boys r 1 and 3 and need some new ideas! I’ve kept my (now 8) children in church with us from birth. But honestly, I’m getting weary after 13+ years of training. I need a reminder of “why” we do this and would so enjoy some tips for making it a meaningful time, rather than just the opportunity to learn to sit still and be quiet. I’m excited to read how others manage. To integrate children into church service (“big church”) the parents have to be willing to be seen as “different”. It IS hard sometimes to be the only ones with littles in the service, but it is SO worth it for us to be together as a family. At first, people kept trying to convince us to have our kids go to their class during the service – so we had to (gently and without condemning their choice) explain that this was our decision for our family. I think a lot of times it makes other parents feel like we think we are better than them or that we just don’t understand that they “need a break” (their words) – so I think it’s imperative to be firm yet kind if that is what your family chooses to do. The point isn’t to alienate other families from ours. Hopefully they can see what a joy it is for us to have our littles in church, even when it is trying. We find that it’s relatively easy to keep the littles still & quiet (quiet books, coloring pages, simple sorting toys, etc.). It can be harder, sometimes, to engage the middles in the service, especially if they feel like it flies just above their heads. Two things that we have done to remedy this are dedicating our family’s Sunday night worship time to the details of the sermon we all heard earlier at church, and by asking all of the kids to keep a running list of scripture as it is noted in the church service. This “brings it home” so to speak, and keeps us all on the same page! We try to keep them involved in the service. I have sheets for them but my struggle is often no matter how hard I get them to bed early – they inevitably are still exhausted when we get them up. We have early service and my husband does worship in it so we can’t switch to a later one. So often the boys fall asleep. We are thankfully able to keep our children with us during worship. We allow them to bring a quiet, tuck-able toy to keep their hands busy during the sermon. We then discuss the sermon during our Monday morning devotions. Practice at home during family worship. Our family is right in the midst of this as our son just started Kindergarten and at our church, once they start K, they are required to attend the church service with their family. I’m always on the lookout for fresh perspectives and ideas. So far here’s my #1 tip: BUSY BAGS! Just Google that and you’ll get all different kinds of ideas that you can tailor to your child’s age/interest and the setting (church, car, dr. office, etc.). My husband’s family always passes big peppermints during the sermon. It gives the kids something to look forward to! I have a bag with quiet time activities just for church worship service. My little ones know it is only for that time so they enjoy doing these activites during worship. When they are older i encourage them to take notes and we talk about what they learned later. I am a grandmother of 9. When my kids were young, they always sat with us during the church service. We always felt it was important for our children to know we are a family that worships together. They learned to be respectful. We had a special Sabbath bag that held items only for church. Now I have grandkids that do not know how to sit still or listen in church. I am saddened to say this. I would like to learn some new ideas and insight that I can share.